Lucy – I had a really long ‘phone conversation with the Leatherhead Tesco store manager this morning (I’ve met him before, but as you all know, we’ve struggled so far to get really effective co-operation going). I’m meeting him again later this week to at last be able to show him the whole Teazle Wood story in detail, and especially the detailed story thus far of us trying to solve the dreadful litter and store waste problems. He seems genuinely on board this time – he has apologised profusely for not having responded before and for the store failures to date, and he has been out with his staff already and cleared some of the big debris from the north edge of the store. He was appalled and embarrassed by the ongoing mess, and he really wants to work with us all and get this behind us. It was refreshing to finally speak to someone who now acknowledges the problem, rather than making excuses for it. THANKS to all of you who helped make the ‘Teazle Wood calling Tesco’ voice much louder (especially the facebook gang, for keeping up the pressure; Caroline- for so much support on this one, and Dawn Fielding of the Lower Mole Project) – we must obviously ensure that this time the ideas and suggestions are acted on and maintained, but I am feeling very hopeful that there will shortly be: posters in the store to engage the staff; Tesco volunteer days like the Unilever / Wates ones; a managed bin on the Tesco site near the entrance to the wood; much better staff engagement, awareness and pride; fencing along the concrete barrier to catch blown litter; and ultimately – a better corporate role model for the kids who use the wood, and no damaging plastics / food waste / ice / etc. discarded into our natural environment to do harm. I fully anticipate being able to report asap a new lid on the infamous open sewer!! Lucy and I spent a couple of hours clearing out rubbish in the stream which runs along the boundary with the back of Tesco. The litter problem is unfortunately still with us, about 80% of what we picked is new unused plastic bags used for their home deliveries. We also found ice that had been dumped from the freezer boxes, it is illegal to dump anything into water courses. We also know that when the road is swept instead of putting the rubbish into bags it is often tipped over the low wall into the stream. We have started a project to tackle the issue, see the TWEEP tab for more information. What a great year for Teazle Wood – so much has been achieved, and so many people came together to achieve it.Thank you to all the volunteers who have helped with the project so far – your contribution is so valuable. The goodwill and expertise we have aboard is amazing and, as always, greatly appreciated. When I think back to all that has happened, one of the images that keeps popping up in my mind is the string of volunteers in September linking hands to collectively pull debris from one of the big ponds. The amount cleared in a few days, by hand, was remarkable. It reminded me of the ‘Giant Turnip’ story – everyone pulling together to achieve an outcome. (For anyone who doesn’t know the story, “a grandfather plants a turnip, which grows so large that he cannot pull it up himself. He asks the grandmother for help, and they together still cannot pull it up. Successively more people are recruited to help, until they finally pull the turnip up together. The specific ordering and set of people and sometimes animals varies. However in original Russian version the order is quite fixed, it is the grandfather (dedka), the grandmother (babka), the granddaughter (vnuchka), the female-dog (zhuchka), the female-cat (koshka) and finally the female-mouse (myshka). The moral of the story is that only with the help of the weakest and smallest creature (the mouse) can the giant turnip or radish (repka) be pulled up.” Thank you, Wikipedia!). 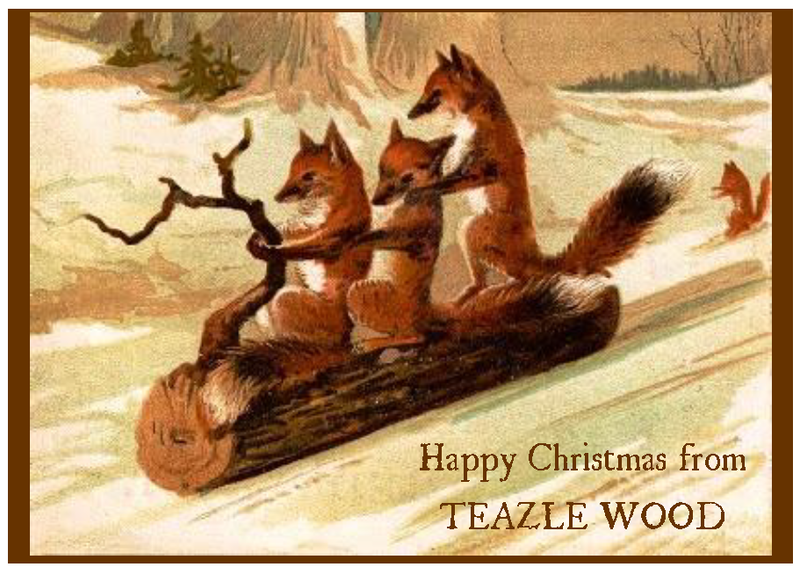 Have a wonderful Christmas, and a peaceful 2014. We will be doing more guided walks in Teazle Wood in late April, when the bluebells and wild garlic should be at their beautiful best (and the mosquitoes won’t yet be out in force!). Do e-mail me if you would like to be notified of dates and times. Found a large group of in Teazle Wood today – perfect, white and clean, these look like they should be delicious but are poisonous 😦 Here’s one (not our photo). Scraping the base of the stem reveals a strong yellow colour – the common name is ‘yellow stainer’. We are looking forward to seeing the second list of Teazle Wood fungi, which this time is being created by Dr. Brian Spooner, Head of Mycology at the Royal Botanic Gardens, Kew, who was in the wood today with members of the Surrey Fungus Study Group. How lucky we are to have the voluntary expertise of people like Brian and David and their colleagues. Thank you to all of them. For anyone seriously into fungi, this is what we found in Teazle Wood on Sunday with David Hawksworth. Another survey is happening today. A massive thank you to two of our volunteers Paul and Ben for your work today in clearing the litter near Tesco. You are so greatly appreciated! Just spent three hours in Teazle Wood with three extraordinary experts in their respective fields – Professor David Hawksworth CBE (mycology), Dr. Pat Wiltshire (botany / ecology) and Peter Murphy. Peter Murphy’s educational background is in Biological Sciences. He has occupied various posts within English Heritage, as a Regional Science Advisor, Coastal Strategy Officer and now Historic Environment Intelligence Officer (Climate Change). We are so lucky to have their volunteered expertise aboard. If every child could experience Pat’s teaching ability, even for an hour or two, the world would be a better place. She identified all kinds of living and dead trees as invaluable teaching aids; in particular, a very old hawthorn dying a slow and macabre death at the hands of ‘Boa constrictor’ ivy, like the mace round a nutmeg. Pat has advised that this tree should be preserved as a stunning example of the action of ivy on its host / prey. Pat and Peter have volunteered to carry out soil samples which will show us through pollen the whole ecological history of Teazle Wood. An amazing week of work by the Lower Mole Countryside Management Project. Great work – THANK YOU to all of you. Home-made cake for the volunteers, made with apples grown on the edge of Teazle Wood. 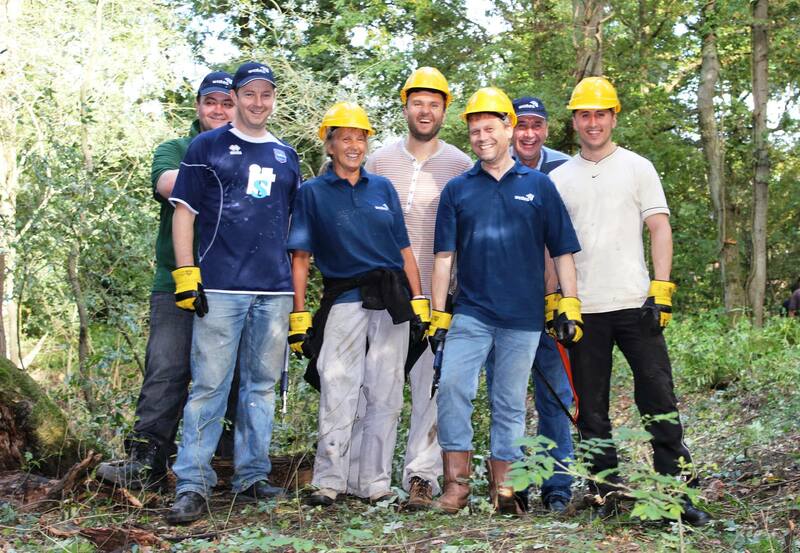 Team Wates – great to see Wates (our first corporate supporters in 2012) coming to help with conservation work in Teazle Wood for the second year in a row. A big thank you to them. See you again next year! !